For New Year's Eve, my husband and I are going to a masquerade. I wanted to make a skull mask for him to wear, but I couldn't get him to sit down, so I could make the base to fit him. Instead, I made one for my daughter. This project is messy, requires a lot of time (mostly for drying and sculpting), and will make you ache. This is my warning. This project was a labor of love and determination. Though it was neat to sculpt something, working on this small tedious project made my hands and fingers ache. My back ached from bending over for hours to sculpt and paint...mostly from the sculpting. It still hurt by the time I was able to paint. Still, it's a neat project, so I'm writing a tutorial for my Skull-A-Day 4.0: Dia de la Abby #31 Sugar Skull Mask. Your Fingers - You will be using your hands to sculpt the plaster strips onto the face of your victim...or yourself. You will also be using your fingers to sculpt with the clay. Your fingers will get messy. Don't freak out. Fine Sandpaper - This is optional, but it will help smooth out the clay surface before painting. I didn't feel like messing with it, so I didn't sand. 1) Find a willing victim. 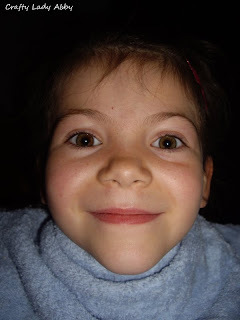 In this case, my daughter. I put a towel on the seat. I wrapped a large towel around her and used a clothespin to secure it in the back. I used elastic head bands to hold back most of her hair. 2) Remove cat (or any animal) away from your water bowl. You don't want them to drink plaster, clay or paint water. 4) Cut some of the plaster fabric into strips. The don't need to be super long. Short and skinny works well. These are about an inch wide and about 5 inches long. I cut smaller ones too, for the smaller areas. 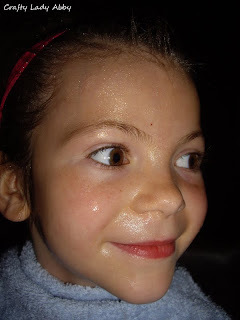 Do this prep before wetting them. You can cut more later if needed. 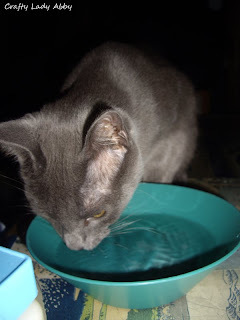 5) Dip 1 strip into the bowl of water. Use your fingers to remove the excess moisture...dripping water. Apply the strip at an angle across the bridge of the nose making the ends mold along the cheek and forehead. You will do the same thing to a 2nd strip, forming an X. I molded the sections touching her nose, to the shape of her nose. 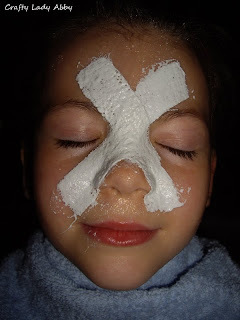 6) Apply strips to the forehead. Overlap them slightly. 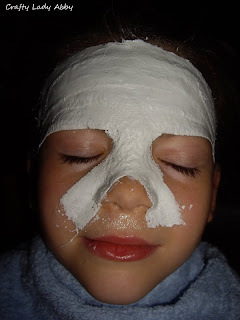 7) Apply strips to the cheeks, mouth and end of nose. Notice, I left the nostril area uncovered. I do want her to breath. She's not really a victim. I covered her mouth just for the aesthetics of this piece. However, for practical reason, you might not want to do that. Apply a 2nd layer of strips to the 1st layer. This is to make the mask sturdier. Don't worry about the lumps, we will cover those later. 8) Cover a pillow with the towel from the seat. Have your victim or yourself lay down with the mask on. Use the other towel to cover up your torso and neck. Take a rest or read a book. 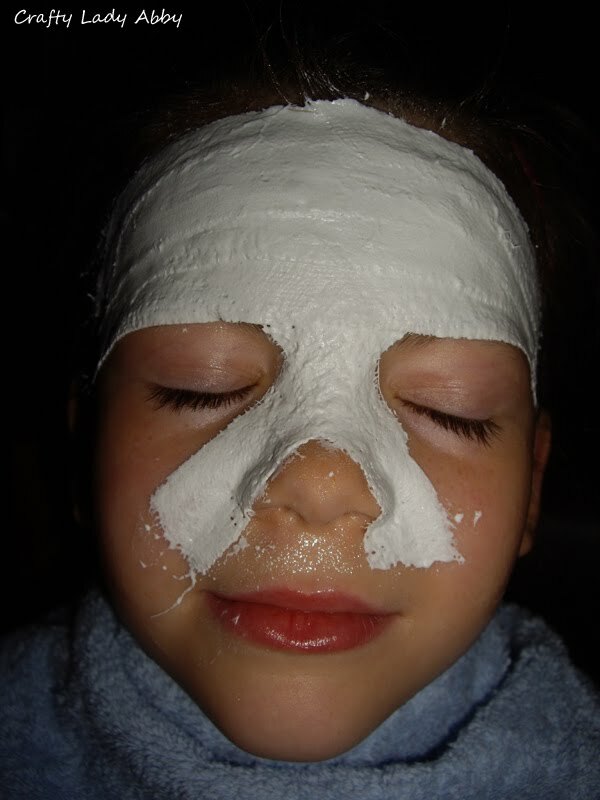 You are waiting for the plaster to set up enough to remove the mask from the face. 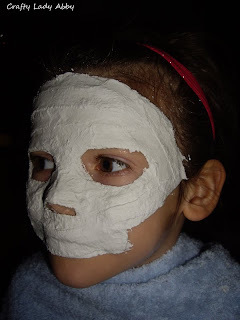 The plaster will heat up and your victim or you will feel the mask start to release from the face. After about 30-45 min, have your victim wiggle their face (if this is on you, you wiggle your own face) to help the mask release. Put both of your hands on the mask gently, have your victim (or yourself, depending) lean forward and gently pull the mask away. You might have issues removing it from around the hairline, but if you have applied enough jelly around there, it should be relatively painless and easy. 9) Using one of the towel, fold it up and make a rounded indention for the mask to rest while drying. It will be resting face down and jelly side up. Let it dry overnight. You might still have some jelly reside left over after this drying period. Wipe it gently off with a paper towel. Bear with me through this section, as it is the 1st time I've sculpted in a long time and I don't know the proper terms. 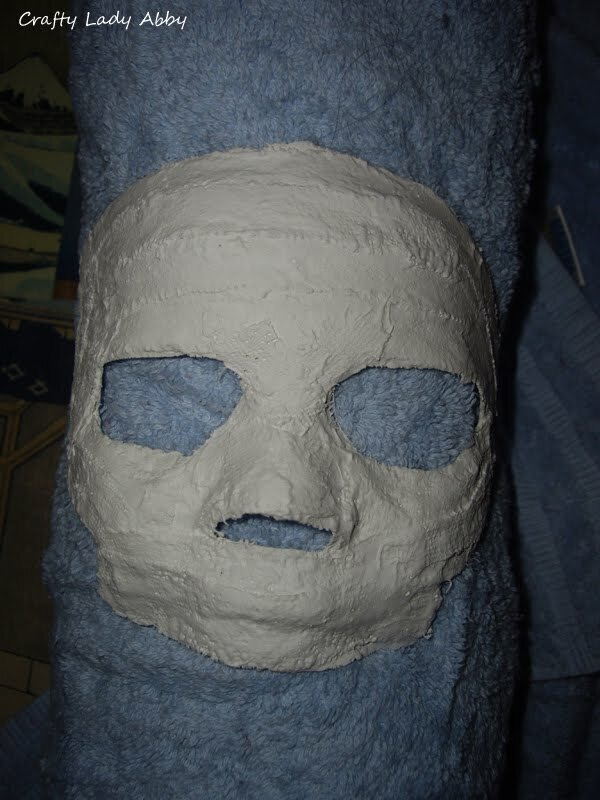 10) After it's dry, roll the towel up small enough to fit under the curve of the mask. I only rolled up part of the towel. 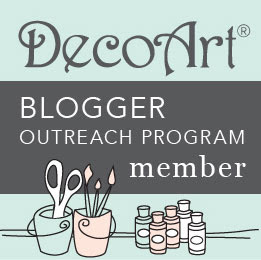 This is for cushion and support while sculpting. Since the towel is rolled, you can easily shift the mask side to side while working. 11) Pinch off a piece of the paper clay from it's block. Roll it into a snake and lay it along the eye and cheek area. Blend the edges into the plaster base. 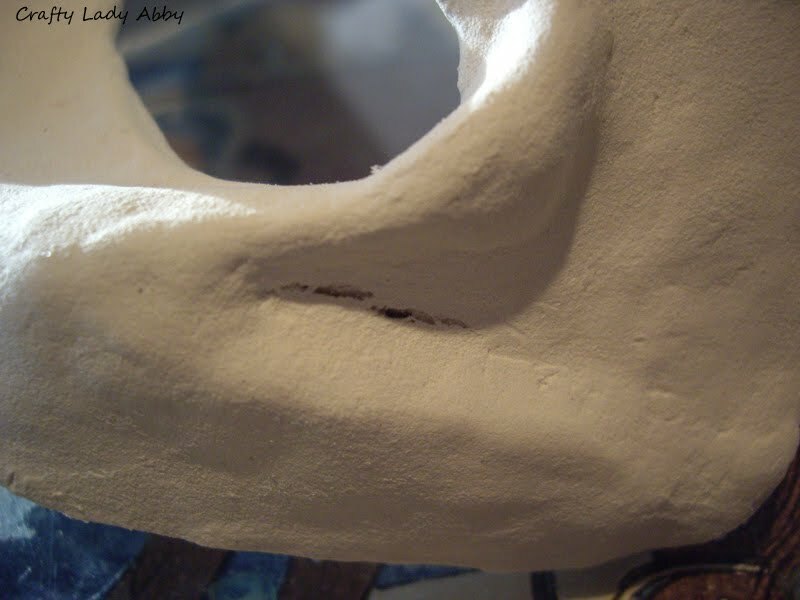 Shape the piece so it looks like the eye bone and cheek bone area of a skull. We'll be adding to this in a bit. You will do the same thing to the right side. 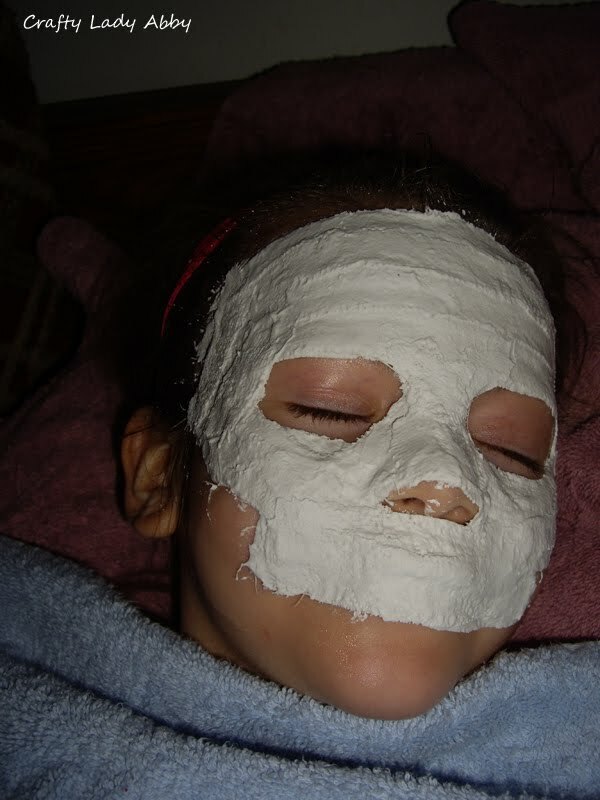 12) Pinch off more clay, roll a snake and lay it along the cheek area of the base. Blend the edges in. Add more clay to where the two snakes intersect. Smooth this all together. Dipping your fingertips lightly in water, will help with blending. Do the same thing to the left side. 13) Pinch small pieces of clay off the block and smooth them into the plaster. You will cover the rest of the mask like this. Make layers if needed. This application method is to fill in and smooth out the bumps from the plaster strips overlapping. 14) For the mouth area, you will need to build up the clay so the lip impressions no longer show. 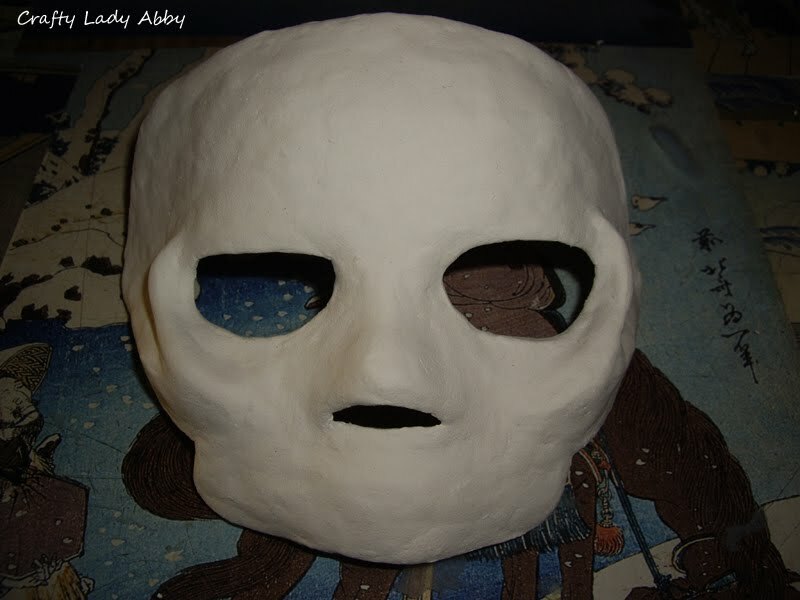 15) Around the outer edge, the eye holes and nose holes, apply small snakes of clay. 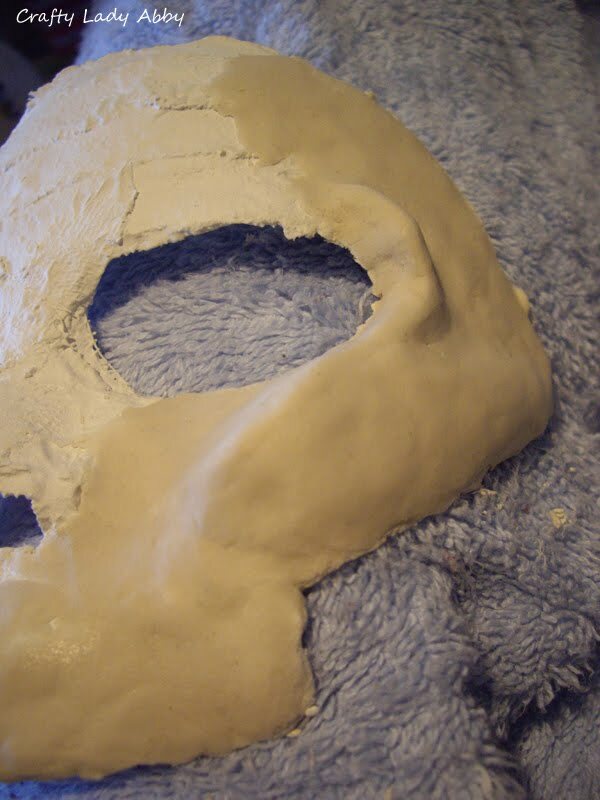 Blend them along the front into the other clay, in the back into the plaster. 16) Store any left over clay (there should be left over) in a Ziplock bag. Squeeze out any air you can, as it is an air dry clay, so air will cause the clay to go bad...dry up. 17) You will lay the mask clay side up to dry over night. 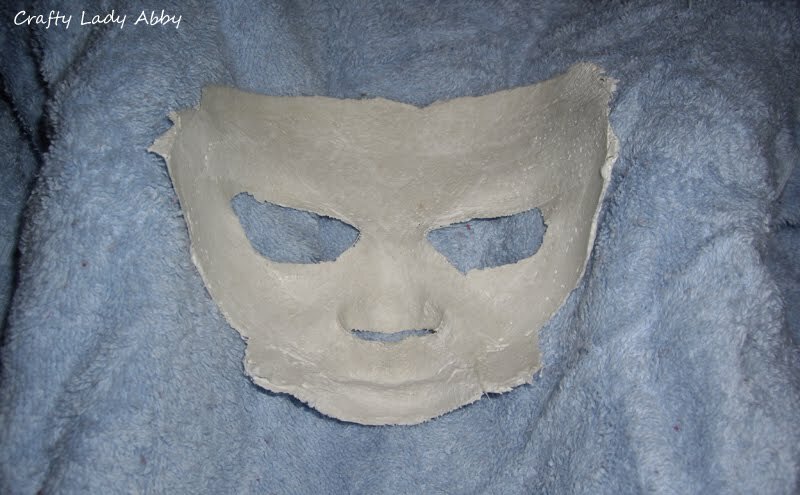 The below photo is of the mask dry. Notice the clay of the mask cracked here. I could have repaired this by wetting the cracked area with a bit of water on my fingers and adding more paper clay, but I didn't feel like waiting. The white paint filled it in well. OPTIONAL: Use fine grit sand paper, to sand the clay smooth. 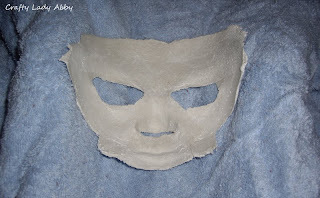 Use a barely damp paper towel to wipe the sanding dust off the mask. 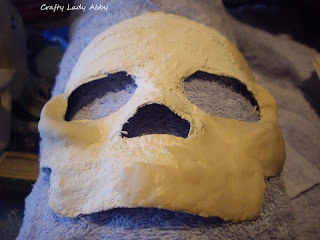 Let the mask dry for about 15-30 min. I didn't do this step, so the drying time is just a guess. 18) Try on the mask and mark with Xs where you want the ties or elastic strap to be. 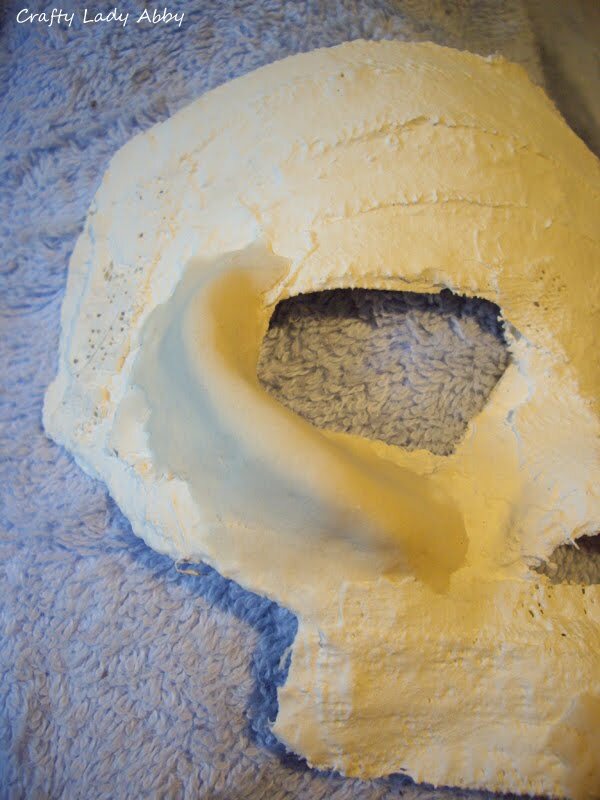 Use the drill to slowly and gently drill the holes through the mask. 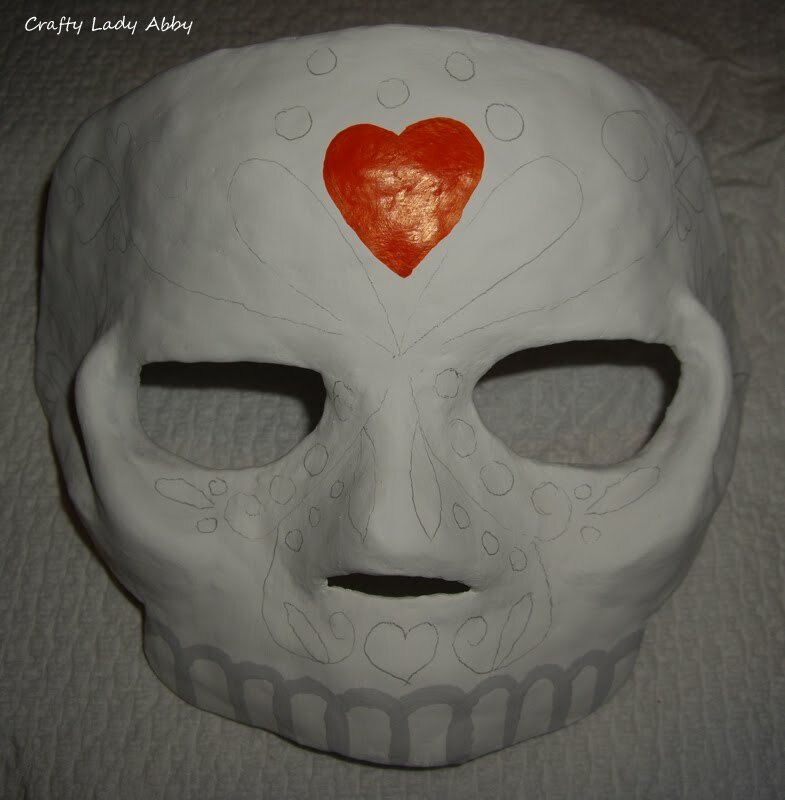 19) Using white acrylic paint and a paint brush, paint the front of the mask, edges and the clay on the back of the mask. Let dry for an hour. 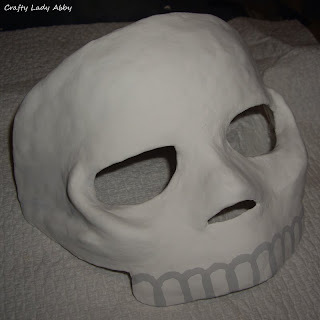 20) Mix a small amount of black paint into white paint, to create grey. Using a small brush, paint teeth onto the mask. 21) Use a pencil to lightly draw a general design on the mask. Try to make it symmetrical...this is hard on a 3D object. 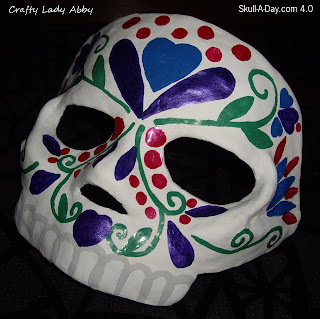 22) Using paint (I used a paint pen) paint your design. Let dry. 23.1) If you are using ribbon for your ties, cut two pieces of ribbon that are long enough to easily tie in the back with some extra for finishing the ends. Slip one end of one ribbon through one hole. Pull the end down about 1 inch so it overlaps the remaining section of ribbon. Flip this short section of ribbon under. Use a straight pin to hold it in place against the other section of ribbon. Using your threaded needle, sew straight across twice where the fold it. Sew again across where the raw edge shows inside the now created loop. Knot off and clip thread. Remove the straight pin. This will prevent the ribbon from fraying by the mask. At the other end of the ribbon, fold the raw edge over twice. Pin still. Sew twice through this fold, knot off and clip thread. Do the same thing to the other piece of ribbon on the other side of the mask. 23.2) If you decided to use elastic, try the mask on and measure one length of elastic that goes from one side of the mask, around the back of the head and to the other side. Add about 4 inches to this measurement to account for overlap behind the mask, and securing of ends. Slip one end of the elastic through front side of one of the holes. Pull it through a bit, so it meets the elastic beyond the side. Use a straight pin to hold this overlap in place. Using the threaded needle, sew back and forth, so the elastic is very secure. Carefully straighten out the rest of the elastic, slip the other end through the other hole and sew the same way. Use glue and glitter, flat back sparkley stones, sequins, small prong studs, spray glitter, etc. to add shimmer to your mask. 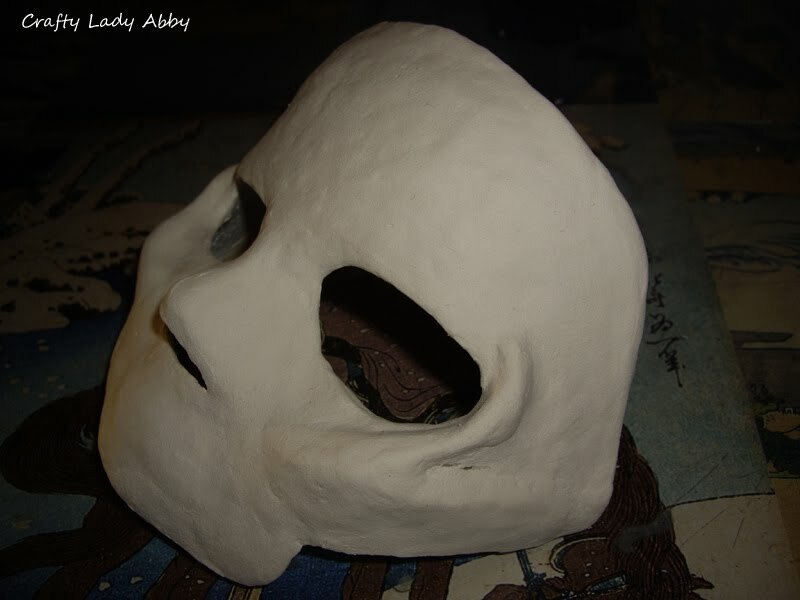 Use bent paper, more plaster strips and more paper clay to add horns to your mask, like the goblin masks in Labyrinth. Use glitter and feathers, lace, fabric flower petals, wire, etc to add texture and dimension to the mask. Small children can be easily swayed.